From 140 second snippets and boomerangs, all the way to immersive, mobile-optimised films, going live and seeing the world in 360° – there are more possibilities than ever if you’re wanting to amp up the video in your social content mix. The numbers are huge. According to the Cisco Visual Networking Index (VNI) Forecast and Trends 2017 – 2022, 80 per cent of all internet traffic will be video by 2021. 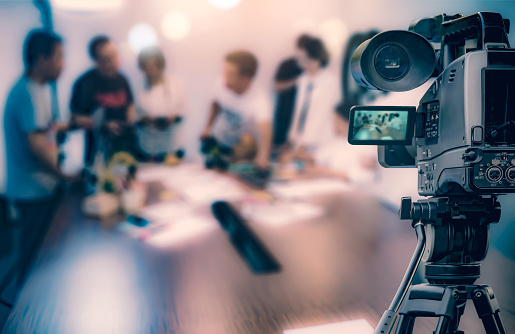 What’s more, people want it: 85 per cent want to see more videos from brands, and 72 per cent would choose video to learn about a product or service where there’s also text available. No longer is the medium confined to top of the funnel, purely for awareness and audio/visual delight; shoppable videos (interactive content that can link directly to an eCommerce listing) directly align social media video content with actual conversions. And all the major channels are putting their money where their mouths are when it comes to social video, with Facebook paving the way via Watch, Instagram jumping on the bandwagon by launching IGTV, LinkedIn finally integrating native uploads and Twitter building on its live broadcast offering. As persuasive as all that sounds, it’s easy to feel intimidated by the thought of venturing into video. Budget, resource, skills and confidence are the most common obstacles to uptake. But since hesitation is usually just fear of the unknown, let’s get to know a couple of the most common formats, as well as their unique benefits and challenges. Whether it’s the 2 minute 20 seconds you’re limited to on Twitter, or the 60 seconds on Instagram, short-form video is a quick and effective way to get a message across in a world suffering from a notorious deficit of attention. Despite the character limit being upped, brevity is still synonymous with Twitter. Here, @ThisIsEng uses just ten seconds of video to compellingly convey its call to action: ‘get into engineering. Find out how by visiting our website.’ The challenge of such a short video is all in the edit. You need to be economical to get that level of polish in the finish. Keep the message clear and the user engaged. Of course, it doesn’t always have to be too refined if that’s not the result you’re going for. Short, uncut clips like this one can amass millions of views, and while you might not use it for a TV spot, people are used to seeing this sort of ‘unpolished’ footage on social media platforms, making it appropriate for the channel. IGTV is Instagram’s response to the increasing uptake of digital video, optimised for viewing on mobile. Not only does it provide brands with fresh opportunities for discoverability among the 800 million-strong Instagram audience, but it’s also a way to “get closer” to that audience (a phrase Instagram uses a lot) with the capability to host videos of up to one hour. Nike used the platform to share documentary-style videos focusing on ‘everyday athletes’. The brand made the most of the intimate format of content to get its messages across, weaving the story of how its products factor into people’s everyday lives and make them better. As director of global brand communication for Nike’s brand voice, Steve Strand, admitted: “there isn’t really a playbook.” This presents a challenge, yes, but also a huge creative opportunity on the channel. While Boomerangs can appear to some as gimmicky and perhaps a little lowbrow, they can actually be an interesting way to present information in a different way – a way which is more likely to jump out at users from within the newsfeed. For example, this quick product demo from The Verge showing the Microsoft Surface book laptop screen’s detachable feature is infinitely more compelling than a still image or a regular, run-of-the-mill video. The challenge here is creative execution, and remembering about variety of content – too many of these could get irritating. Playing with Microsoft’s Surface Book laptop in Instagram’s shiny new #Boomerang app, which records 1-second video loops. Probably the most technically inaccessible video format that we’re discussing, a 360° video requires an omnidirectional camera or a multi-camera rig, as well as specialist software to process and edit the footage. However, what it lacks in technical accessibility, it more than makes up for in impact. This would be a great tool to invite your audience to experience what it feels like to ‘be there’, for example, in an exhibition or on a construction site. The Emmy’s used this format to allow its audience to experience the action right from the red carpet. Live video currently makes up 5 percent of Internet video traffic, and that figure is expected to jump to 17 percent within five years. Going live on social can distinguish you from others in the newsfeed as users get additional notifications, so can have more impact than a pre-record. Content can go from informal selfie-style pieces to camera, to full-scale productions, such as this live NASA screening of a Mars landing. This is one with arguably the most difficult obstacle to overcome when it comes to uptake for brands – it can be difficult to get buy-in from stakeholders because of element of risk, and of course, you need someone (or an entire team) who is comfortable and confident on camera. Planning is the key. A simple steadying gimbal for a smartphone can negate the risk of unsteady footage, while apps are available to help you capture nicely composed shots and high-quality video. Knowledge is power, and with the right support, you can drive your social video content agenda forward, building your social success with increased engagement, following and brand awareness. If you’d like to discuss how we can integrate video content into your social strategy, get in touch.